Ricardo Broxham, who won the Junior Tour of Ireland last season, has been given a one-year doping ban, his national federation has announced. From South Africa, he won the overall crown at the Junior Tour last July as a 17-year-old. However, just four weeks after his triumph on Irish soil he returned an adverse doping sample. Cycling South Africa has just announced a one-year doping ban for the rider, who is now aged 18 years. He returned a sample which was found to contain Heptaminol, a cardiac stimulant that increases blood flow. It was taken off the banned list in 2004 but reinstated two years later. Some of the bans arising from its presence in cyclists’ samples have been very short. 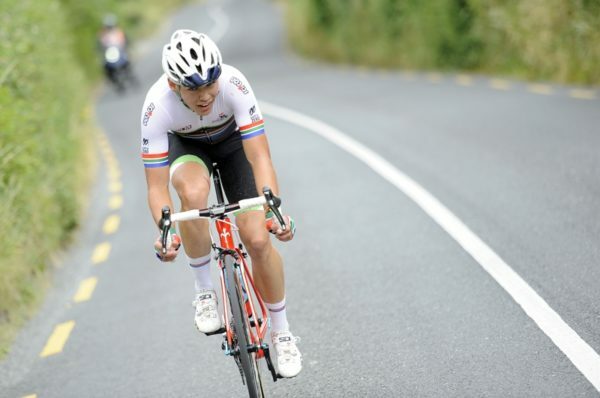 Ricardo Broxham not only won the Irish tour last year but was also crowned South Africa junior road race champion before his visit to Ireland. He took silver in the nationals TT and rode for his country at the junior track and road Worlds. He failed to finish the Worlds road race and was 6th in the omnium on the track. His one-year suspension has been confirmed publicly by his national cycling federation in a statement. The doping ban is very disappointing news as he is the reigning Junior Tour champion. It appears Ricardo Broxham has not been stripped of that title as the anti doping violation came after the race. He was 3rd on the opening TT eight months ago and took the yellow jersey on the Gallows Hill stage. Ricardo Broxham on the way to the race leader’s jersey in Ireland last year. “Cycling South Africa reports that Ricardo Broxham has been sanctioned for an anti-doping rule violation of Articles 2.1 and 2.2 of the UCI Anti-Doping Rules after an in-competition test conducted on 18 August 2018 confirmed the presence of Heptaminol in his sample,” the federation said. “The UCI Anti-Doping Tribunal has imposed a period of ineligibility of 12 months for the violation, applicable as of 22 September 2018 up to and including 22 September 2019 and a disqualification of all results from the 2018 UCI Junior Track Cycling World Championships. In 2008 Kazakhstan’s Dmitriy Fofonov (Credit Agricole) tested for heptaminol at the Tour de France. He would resume his career, with Astana, the following year. He argued, successfully, he had ingested the substance inadvertently while taking a supplement to ease cramp. As a result, his ban was reduced to three months after his explanation was accepted by the anti doping authorities. In 2013 Sylvain Georges (AG2R-La Mondiale) tested for Heptaminol at the Giro d’Italia. However, he insisted he had been “negligent” and was not a doper. He said his six-month ban proved his argument had been accepted as truthful.